Dangerous Crossing is a weak thriller with a plot already done to death in countless radio shows and movies: somebody claims that a relative or friend has disappeared, but no evidence of the missing person's existence can be found. This gimmick works well enough when encountered for the first time, in movies like Bunny Lake is Missing or the relatively new Jodie Foster show Flightplan. Fox's 1953 release strands lovely Jeanne Crain among a no-star cast with only the unemotional Michael Rennie to keep her company. Viewers who can't figure out the mystery by the end of the first reel need a refresher course of Perry Mason TV episodes. Happy newlywed Ruth Stanton Bowman (Jeanne Crain) checks on board the SS Monrovia with her husband John (Carl Betz), only to be instantly thrown into a panic. John disappears, leaving her without her passport; a thorough search of the ship turns up nothing. When nobody on board can remember seeing John, the captain (Willis Bouchey) assumes that Ruth is either pulling a stunt or insane. Ship's doctor Paul Manning (Michael Rennie) takes an interest in Ruth's case and tries to believe her side of the story. Ruth begins to crack up under the strain, especially after she receives a mysterious nighttime phone call -- from John. Dangerous Crossing plays as what it is, a radio show enlarged for the screen. Despite some atmospheric stalking scenes on the foggy boat decks, everything is conveyed in tidy expositional dialogue; little occurs that a blind person couldn't follow. Jean Crain is more than acceptable as the standard anxious heroine, but the script does her no favors. Following the format of a radio show, little patches of voiceover serve to clarify situations. Ruth Bowman realizes that her erratic behavior is becoming counterproductive, and we hear her consciously decide to behave more calmly. Ms. Crain isn't allowed to express a single thought without benefit of verbal explanation. The rest of the show consists of scenes among a small number of passengers that are either sincerely concerned for Ruth, or part of a wicked conspiracy to drive her insane: it's Ship of Gaslight. In the midst of her anguish, Ruth has time to enjoy herself with deck sports and dresses up to dine with the ship's doctor. By the time her background as a wealthy heiress is telegraphed into the movie (with a real telegram!) the mystery has become almost completely transparent. The crisis is resolved in a brief 76 minutes, which includes a redundant wrap-up scene to review details for comatose viewers. Studio head Darryl Zanuck was known for riding close herd on his scripts, and we can only assume that his attention was diverted by the launch of Fox's CinemaScope process, a high-stakes gamble. Dangerous Crossing is one of the studio's last flat releases, quickly confected to yield additional use from expensive shipboard sets constructed for the studio's hits Titanic and Gentlemen Prefer Blondes. Michael Rennie is the same sincere but unexciting presence as he is in most of his films. The script gives Carl Betz only a couple of minutes on-screen, with the result that his character remains tied to the film's trick premise. Mary Anderson and Marjorie Hoshelle's thankless roles require them to maintain ambiguous, neutral attitudes throughout. Jeanne Crain must carry the entire show single-handed, and that it works as well as it does is a tribute to her talent. The most successful version of this mystery gimmick is Alfred Hitchcock's The Lady Vanishes, no contest. Even back in 1938, Hitchcock knew that the 'impossible disappearance' gag wouldn't stand by itself, and his writers Launder Gilliat embroidered their story with plenty of witty, intelligent surprises. Dangerous Crossing pales in comparison. Clearly instructed to wrap the shoot up in record time, efficient director Joseph M. Newman films the script with a minimum of involvement or passion. A stronger director would have insisted on skipping those insulting 'inner voice' passages left over from the radio concept, and found ways to convey at least some of the exposition in images instead of words. An even closer match can be found in a superior English thriller from 1950, So Long at the Fair. An almost identical mystery unwinds at the 1896 Paris Exposition, with young Jean Simmons searching for a lost brother. The story elements are handled with much more care, generating some genuinely frightening scenes. 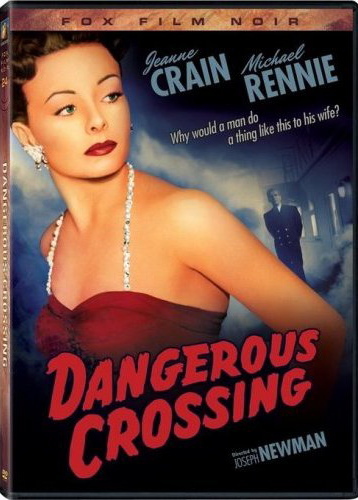 Dangerous Crossing is an okay but undistinguished suspense thriller that seems to have reached DVD to provide another title for the Fox Film Noir line. The film has scenes at night and a heroine in distress, but never approaches the minimal definition of a Film Noir. It's too bad that legal obstacles continue to block home video releases of the classic Fox Noirs Cry of the City and Boomerang! Fox's DVD of Dangerous Crossing is a fine transfer and encoding of a B&W picture that probably hasn't been out of the vault in decades. It's been given a full contingent of extras, which in this case amounts to embarrassing overkill. The featurette Peril at Sea presents good film clips showing how Dangerous Crossing's hand-me-down sets were used in other, bigger films. Jeanne Crain's granddaughter is on hand to talk about her famous relative ("She was bigger than life"). Noir experts Eddie Muller and Alan Rode appear with Robert Osborne in interview clips clearly taped in sessions covering many films at once. As there's nothing remotely distinguished about Dangerous Crossing, the discussions never get beyond generalities. Osborne says that the film has great qualities, and then explains that its great quality is being a good example of the efficiency of the Fox studio system. That's like praising one's fiancée because she's an outstanding example of an average woman. A pressbook, a still gallery and an anemic trailer appear, but the best extra by far is an isolated track containing Lionel Newman's score. Fox has been adding isolated tracks a lot lately, and fans of music scores really appreciate them. 1. Not that Savant is claming infallibility in commentary reportage. In the first release of Hush... Hush Sweet Charlotte, I wrote down Hotel as a TV credit for Bette Davis, but for some reason I said Dallas in the recording session. I received quite a few deserved emails on that one, and I guess I have no future in politics. Reviews on the Savant main site have additional credits information and are more likely to be updated and annotated with reader input and graphics.